What is important in the treatment following surgery? What time should the stitches be removed? 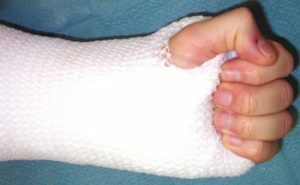 Is physical therapy after surgery of a trigger finger or trigger thumb required? After which time can I do heavy work and sport? The dressing should be chosen so that the thumb and all fingers are flexible. At the same time, however, the wound can be protected. The dressing is renewed by the physician at regular intervals, while inspecting the wound. Please move your hand operated! Stretch and bent your fingers and thumb immediately after surgery. But do not overstretch the fingers. Please move the fingers and thumb, but please do no heavy work with the operated hand in the first 2-3 weeks after surgery. Then the wound can heal best and the swelling of the hand is quickly reduced. It is important in everything you do – as long as the skin-suture threads are in place – prevent the wound for moist or even dirt.For showers there are protective covers. Alternatively, you can also use two shopping bags attached to the forearm with a dense patch, so that no water can go in the direction of hand. Be careful! Not the shower is important. From a broader picture: Important is an undisturbed wound healing. Is the wound healing undisturbed, I remove the stitches about the 12th day after surgery. Pulling the stitches is on a well-healed wound very simple and with virtually no pain. 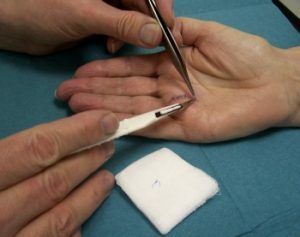 Especially in hand it is very gentle to pulling the stitches with a scalpel. But it is also possible to pull the stitches with scissors and forceps. In some cases this can be helpful. If for example the mobility of the finger is far below average and shows no progress, professional help is needed. In many cases own practice is sufficient. In regular wound healing, 1-2 days after the stitches removed, you can move your hand in warm water. Here it is good practice to do this during the first 6 – 8 weeks. (3 x 5 minutes per day). This also helps to avoid new trigger fingers. Further recommended is a gently massage of the scar with a fatty ointment during the first few months several times a day. On average after about 6 weeks. At this time, however, the scar in the hand is still somewhat sensitive. In the first weeks and months after hand surgery patient is important. If the surgery was completed without complications: than respect pain as an advice of your hand. The hand tells you with the pain if your behavior is right or wrong.